Located out of Stuart, FL and North Chicago, IL, premier luxury motor coach manufacturer and provider, Liberty Coach, will be in Indio, California at Desert Shores Resort and Motorcoach Country Club. Vice President Frank Konigseder and his team will be there with one of their latest coaches, the 2013 H3-45 Double Slide sporting a custom paint design by Dean Loucks, on display to the public. This is what our coaches are made for, we jump at opportunities such as this where we are able to take our custom coaches cross country to share our latest creations with the public. Liberty Coach is the premier provider of custom luxury motor coaches in the United States, proudly setting the pace for the industry since opening their doors over 40 years ago. Vice President Frank Konigseder and the Liberty Coach team will have one of their new 2013 luxury motor coaches on display in Southern California from March 17, 2012 until April 27, 2012. For one day only, Liberty Coach will also be at Desert Shores Resort to host country singer Patrick Thomas continuing on to Motorcoach Country Club thereafter! "This is what our coaches are made for,” said Konigseder "we jump at opportunities such as this where we are able to take our custom coaches cross country to share our latest creations with the public.” Interested in this event? Get all of the event details below. Liberty Coach in Indio, California at Motorcoach Country Club. To start off their southern California tour, Liberty Coach will be a the Desert Shores Resort to display their coach, as well as host country music singer, Patrick Thomas in concert. From then on, Liberty will be at Motorcoach Country Club. Come visit Frank Konigseder and the Liberty Coach team to learn about all of the latest features, systems, and technologies utilized in Liberty’s luxury motor coaches. One of their latest coaches, the 2013 H3-45 Double Slide Bath and a Half, with a breath taking paint design by Dean Loucks, will be on display for the public, the media, and anyone else with an interest in the luxury motor coach lifestyle. Liberty Coach of Stuart, FL and North Chicago, IL is the premier provider and manufacturer of custom Prevost motor coaches. From March 17, 2012 until April 27, 2012 Liberty’s coach will be on display from 12:00PM-3:00PM. Desert Shores Resort – 48-170 Hjorth St. Indio, CA 92201, Desert Shores Resort can be contacted at (760) 775-9808 (March 17, 2012 only). Motorcoach Country Club – 80-501 Avenue 48 Indio, CA 92201. Motorcoach Country Club can be contacted locally at (760) 863-0789 or toll free at (800) 277-0789 (March 18, 2012-April 27, 2012). Liberty Coach leads the luxury motor coach industry by way of style, design, and innovative technology; this event provides the people of Southern California the exceptional opportunity to come out and see one of Liberty’s new custom coaches first-hand. With locations in Stuart, FL and North Chicago, IL, Liberty Coach and the Konigseder family have been providing legendary leadership in the luxury motor coach industry for over 40 years. 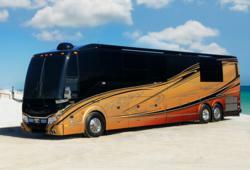 For more information about Liberty’s custom Prevost motor coaches, please visit http://www.libertycoach.com or call 800-554-9877.